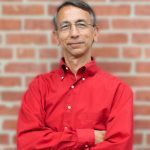 Founder of American Gold Prospecting Adventures, Jim Somers is a seasoned gold prospector who leads prospecting excursions throughout northern New England. 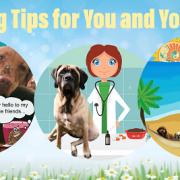 He has been featured in The Boston Globe, The Union Leader, Lost Treasure Magazine and The Gold Prospectors Association of America Pick & Shovel Newsletter. About 15 years ago, my wife and I took our kids to Scottsdale, Arizona for a family vacation. We didn’t have firm plans for the trip, preferring instead to explore the local options upon arrival. After settling in at the hotel, we gathered a bunch of brochures from the lobby and let the kids pick our first adventure. The next day, we headed out to the Goldfield Ghost Town in the Superstition Mountains. We learned all about the gold rush and the legendary Lost Dutchman Mine. We also learned about the town’s history—how it boomed into existence and then, just as quickly, went bust. Finally, we learned how to pan for gold. That hands-on experience let us all feel the rush of adrenaline you get when you find gold in a simple pile of dirt. The entire family was struck by gold fever. After returning to New England with a small vial of gold and some great family memories, we started to do a little research. It turns out that there is not only gold in New England, but a thriving community of gold prospecting enthusiasts all around the region and an opportunity for a local family vacation. 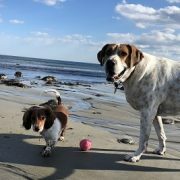 After a few unsuccessful attempts to find gold, we took a trip to New Hampshire. This time, we struck pay dirt! The thrill of that first find, right in our own back yard, gave us the fever—gold fever! There’s something addictive about finding those elusive pieces of gold flakes. And once you find that first piece, it’s hard to stop. You’ll want to feel that thrill again and again. And from my own experience, the thrill never goes away. But it really isn’t just about the gold. While finding gold is always a thrill, gold prospecting isn’t really just about the gold. The real gold is in the relationships you build while you are outside prospecting. When you spend the day sitting in a riverbed, digging up dirt, sifting out the rocks and swirling what remains around in a pan, time seems to mysteriously slow down. It’s a meditative process. Your mind becomes quiet and you start to think about things in a different way. You might notice the cool, clear water and appreciate the natural beauty of the area, or you might strike up a conversation with another prospector—a friend, family member or perfect stranger—sharing their stories while learning more about yourself. You forget all about your cell phone, tablet and computer—even the kids will lose interest in technology after a little while on the river. And when it comes time to run the remaining dirt through the sluice, everyone on the river shares the excitement and hope of hitting pay dirt! At the end of the day, even if nobody finds a speck of gold, everyone realizes that they had a great time and goes home with new friends and memories. We want to share this experience with your family. Today, I’m excited to have partnered with Dan Brown and Bruce Roberts to lead gold prospecting adventures for families. We provide all the equipment and teach you everything you need to know about the river and the process of gold prospecting. Our half-day adventures are good for families with younger children, while our full-day adventures are perfect for older kids and families already more familiar with the process. While we can provide you with a wonderful day on the river, the real magic happens when you and your kids become engrossed in an unforgettable shared family experience. If your looking for a unique and memorable family vacation, this is it! Did you know that there was a gold rush in New England in the mid 1850’s? 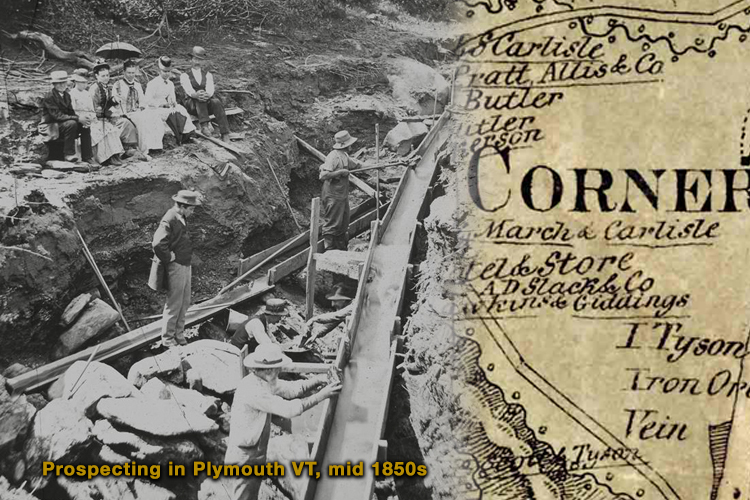 The Vermont Gold Mining Company was established in 1854 and they erected a crushing mill with crushers, stampers and washers, experimenting with how to separate the gold from the quartz matrix. 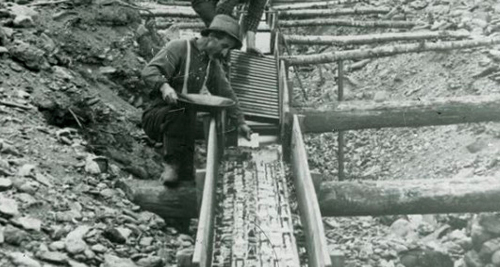 Gold Prospecting was a passion and source of income for many. Gold can be found in all of the 6 New England states! Since the price of gold spiked in 2012 and those “gold fever” reality shows hit the airwaves, there has been a modern gold rush. But the gold here in New England is a bit tougher to find than out West or up in the Yukon. 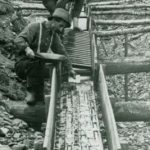 The key to enjoying the unique and exciting world of gold prospecting is to know what you are doing. During my first year of prospecting in New Hampshire, I found virtually nothing. As time passed, I learned some valuable techniques from local prospectors and everything changed…Gold Fever had me in its grip! Now 12 years later, I have the privilege of helping those who also want to enter this exciting activity through American Gold Prospecting Adventures. 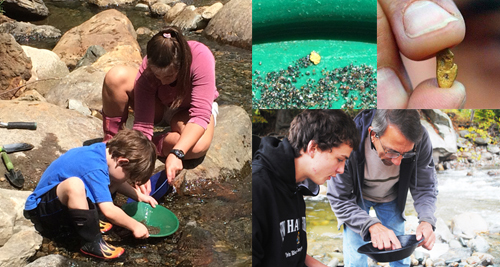 Our 3-hour gold prospecting class is a hands-on learning experience up on the rivers of New Hampshire. For more information, go to www.AmericanGoldProspectingAdventures.com See how you can get “the fever” and start finding your own gold!